I know a number of us have had to face the question of how to translate key documents – policies, codes, employee handbooks and the like – for our organizations. This is critical as an organization expands its presence beyond its country of origin and has to make sure that its employees in these locations can readily understand its key documents and what is expected of them. There is no “golden source” for translation requirements and most of us have limited budgets to get translations done. This is particularly true as many of us now face measures to reduce operating expenses. As a result, I thought I would share some recommendations on how to deal with translating documents based on my experience. Identify the languages you need for your organization – you should consult a few areas to make this determination. I would suggest: 1) Legal or Compliance to help identify legal or regulatory requirements; 2) Human Resources to help identify employment considerations (headcount numbers, languages spoken, historical practice, and any significant issues noted with employee understanding); 3) canvass various internet sites of organizations like your own to see their approach (a number of companies maintain translated documents on their public sites); and 4) Communications to help identify the organization’s practices with regard to communicating with employees (for example, the approach used for CEO or senior management notices). TIP: I found that headcount information is really helpful when using a risk-based approach to determine your “mandatory language list” for your key documents. [A risk-based approach is translating documents into certain languages rather than all languages of countries you operate in based on operations/presence, headcount, history, and legal and compliance considerations, among others.] Also, make sure to reassess this data periodically (either during the annual maintenance of your process or more frequently if your organization is undergoing key business changes) to make sure the data you are relying on to help define key measures is still current. Assign key roles and responsibilities – you should define responsibilities for the individual or group requesting the translation, coordinating the process and someone doing and reviewing the translation. TIP: I found that a centralized process with a key administrator (individual or group) works best in terms of coordination. You have central gatekeeper who will not only coordinate requests, but also help to maintain records, the budget and manage the overall process. Also, if you do use a third party service provider you should still account for an internal resource to check the translation for accuracy with the original document. Document, publish and maintain the process – this will not be a one-time undertaking, so make sure you document your process, publish it and maintain it periodically so that your employees know what they need to do (see below for a sample workflow). TIP: Start with the initial development of the process to help define – what needs to be translated, which languages, who must be involved, how the process works, and where key records will be maintained. Once done, I would then strongly recommend posting the process on relevant internal sites and setting a maintenance schedule (annual is fine but it can be more frequent if appropriate). Determine budget and priorities – you need to define what your budget is and whether it will be a central one used to cover costs or if you will need to charge back groups. Also, make sure to set priorities to manage expectations as requests come in. TIP: I know when using a third party translation service it helped to know what the budget was at the outset to better manage the relationship and requests. Separately, if you are using a third party, you should try to negotiate better pricing for an omnibus effort in lieu of separate agreements with your organization. Canvas the key areas of your organization to see what arrangements they have in place and work with Legal see if these arrangements can be expanded upon to get your organization a better deal. Also, use an internal tracking systems (for example, a list on SharePoint or excel inventory) to monitor your requests and track progress. Define access – make sure you identify easily accessible places for your employees to access these translations (for example, your organization’s Intranet Pages, team SharePoint sites, and other central document libraries). TIP: I would suggest advising employees where to access these translations not only at issuance of the document but also periodically. For example, you can include a link to the specific translation or a page where these are located in your organization’s communication alerts, company newsletters, and references in the key documents or email notices. Keep records – you should keep records of the translated documents to make future updates easier in light of any changes to the original document or to refresh the document periodically. TIP: I used company websites and SharePoint sites to house translated documents. Also, make sure that you use a defined naming convention to make it easy to access the information – the title, date and language (for example, ABC Policy.german.july2016). Great post and information, Patty. 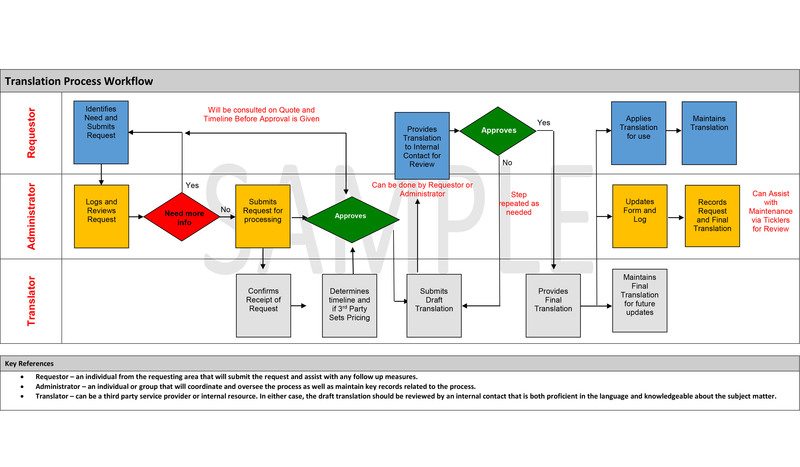 As a program manager and someone who has led projects and needed to create and maintain documents as the PM, I find process/workflow maps very helpful for getting organized ,tracking and testing assumptions about the process. I also like your acronym ! Myra, Many thanks for the kind words. Yes, I agree – excellent recommendation and documented workflow. I find the key to implementing any process is to ensure there are ongoing communications. You can do this by repurposing the message through applicable channels throughout the organization (i.e. emails, intranet, newsletters). Margaret, many thanks for the kind words.